Trying to achieve what is one of the most difficult tasks in sport, let alone just table tennis, beating players from China in consecutive matches was the challenge which faced the partnership of Romania’s Ovidiu Ionescu and Spain’s Alvaro Robles in the final of the Men’s Doubles event at the Seamaster 2018 ITTF World Tour Platinum Kaisa China Open in Shenzhen on Sunday 3rd June. Sensationally at the semi-final stage they had beaten Ma Long and Xu Xin, the no.3 seeds (11-9, 11-9, 4-11, 4-11, 12-10) but in the eyes of many the best pair in the world; in the final they faced Fan Zhendong and Lin Gaoyuan, the no.6 seeds. It was to be defeat (11-9, 11-4, 11-4) but the European duo departed Shenzhen with heads held high. In the opening game Ovidiu Ionescu and Alvaro Robles matched Fan Zhendong and Lin Gaoyuan; perhaps if there was a key, the faded forehand from Fan Zhendong wide to the Ovidiu Ionescu backhand was a prominent feature. Equally late changes of direction from the Romanian’s forehand played down the line, left Lin Gaoyuan gasping for thin air. Win a close game and confidence blossoms, it is a well-worn adage but proved very true for Fan Zhendong and Lin Gaoyuan; they made an electric start to the second game, they never looked back. Confident in the third game Fan Zhendong and Lin Gaoyuan moved ahead 4-1; Ovidiu Ionescu and Alvaro Robles called “Time Out” and walked to the surround for advice from Denmark’s Jonathan Groth who was fulfilling the role of coach; a true European international team! 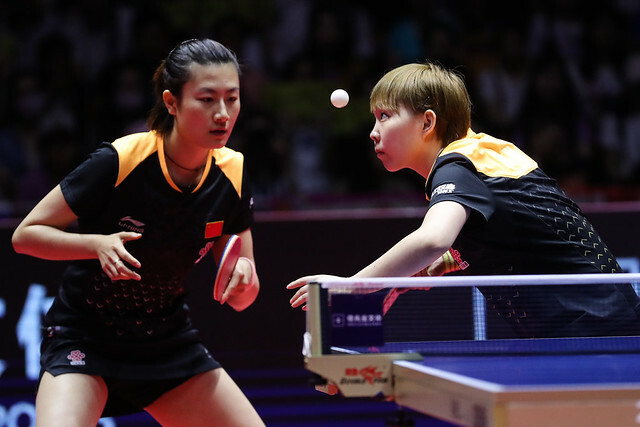 However, the writing was on the wall, the magic of two days earlier was not to be repeated; at 10-3, Fan Zhendong and Lin Gaoyuan held seven match points. Ovidiu Ionescu and Alvaro Robles won the next point but no more; the title belonged to China. Notably for Fan Zhendong and Lin Gaoyuan it was their first appearance in an ITTF World Tour Men’s Doubles final as a pairing; more remarkably for Ovidiu Ionescu and Alvaro Robles it was their first appearance in any tournament!